Located 100 miles off the coast of Spain, the island of Mallorca is one of the crown jewels of the Mediterranean. Famous for its spectacular steep and rocky coastlines, secluded sandy coves, towering limestone mountains, and lush and fertile countryside, this island is as unique as it is beautiful. Besides stunning natural beauty, you will be greeted by a sense of old-world culture and charm, as well as a heritage rich in local traditions. The Mallorcan people are known for their remarkable hospitality and sunny disposition. Our world-class staff will make you feel right at home. Your week with us is about to begin. Get ready for the time of your life! You can expect a schedule similar to The Ashram in California yet with its own unique elements. The program is limited to 14 guests per week. Mallorca is known for its amazing and challenging hiking. You will experience mountain treks with up to 3000 ft. elevation gain daily. Your afternoon fitness activities will include kayaking, TRX, circuit training and mat Pilates. You will begin and end each day with a yoga class designed to tone, stretch, and rejuvenate while your body will be nourished with our organic vegetarian cuisine. 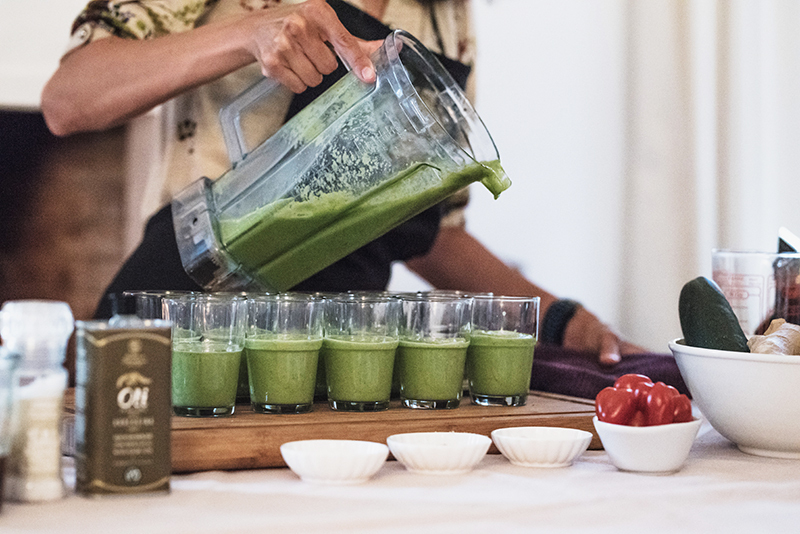 Expect to feel lighter, energized, and refreshed with your body cleansed and your spirit renewed all the while making new friends from around the world. Our locally-inspired food is designed to help you detoxify as well as delight your taste buds. We use a nutrient-dense nutritional approach when we create our Spanish vegetarian menu. 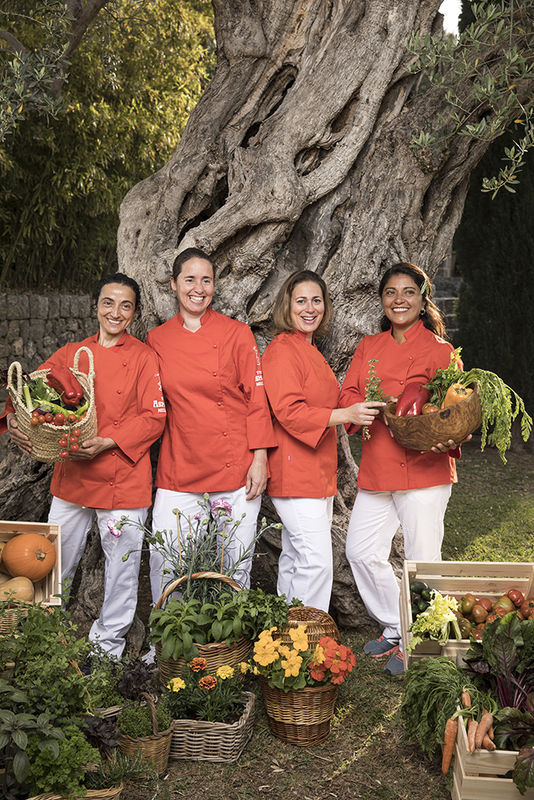 Living foods, juices, and lots of fresh vegetables are uniquely prepared using traditional Spanish and Mallorquín recipes like fluffy egg Tortilla Espanola and delectable Coca de Trampó. 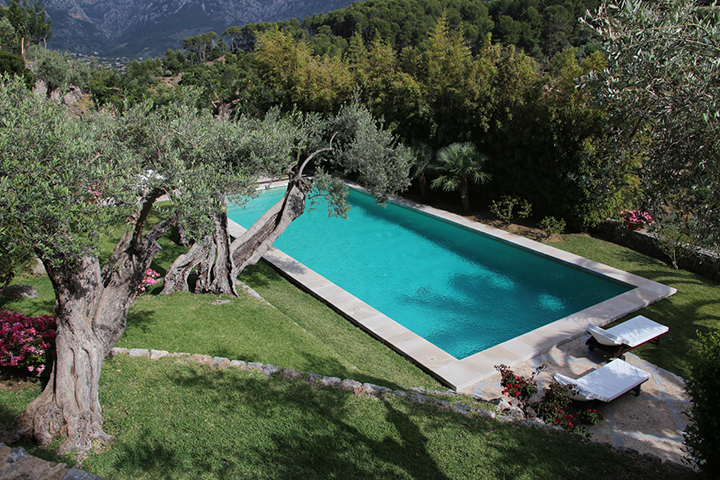 You will be staying in a beautifully restored 17th-century olive farm, set in a peaceful valley of the scenic Tramuntana mountain range near the picturesque village of Porto Sóller. The estate or “finca,” Son Salas, is surrounded by 100 acres of olive, lemon and orange groves where gardens and manicured terraces offer stunning views in all directions. There is also a large salt water swimming pool on the property. The house is built around a cobblestone courtyard and features an outdoor kitchen/dining pavilion, the original 17th-century olive press, elegant fireplaces, and stately balconies. The bedrooms are located on different levels, many with beamed ceilings and decorated with local art and antiques. Most are double occupancy with private rooms given on a first come, first serve basis. Many of the bedrooms have en-suite bathrooms. The beauty and peace of this magnificent finca will make you want to return time and time again. Ashram Mallorca, is US $5,800 per person. Your deposit of US $2,000 is required at the time of booking and is refundable if you cancel 60 days in advance of your arrival date, minus a 10% cancellation fee. After that time, your deposit is forfeited. Your balance will be charged to the same credit card 30 days prior to your arrival. Please note that if you cancel after that date, you forfeit the entire Ashram Mallorca cost. We are happy to issue a refund but only if we are able to book another guest in your place. We strongly recommend travel insurance for unexpected change in plans. For Reservations, please call us at 1.818.222.6900. You can also email us at mallorca@theashram.com. We are happy to answer your questions and reserve your time with us at The Ashram Mallorca! You arrive Sunday at 12 noon and depart the following Saturday at 11:00am. Mallorca has a big international airport, Palma de Mallorca, (Airport code PMI) with connections from most larger cities in Europe. HOW DO I GET TO THE ASHRAM MALLORCA FROM THE AIRPORT? You will take a taxi from outside the airport entrance. It is a 30 min. drive and the cost is about 50 euro. We will email you directions in Spanish for the driver. There are no limo services or arranged pickups. We will email you a list of recommended hotels and you can take a taxi from there to The Ashram Mallorca. With your reservation confirmation, we will email you a detailed packing list. Most important is comfortable and broken-in hiking shoes. Yes, there is free WiFi in each room. We do ask that you minimize your use for the sanctity of our retreat as well as consideration for other guests. For this reason, cell phones and computers are not allowed in common areas, on hikes, or in our buses. We would like to know your height, weight, age, physical fitness level, workout routine, and current general health status. On arrival, we will further discuss your health profile and any concerns you may have. WHAT LEVEL OF PHYSICAL ACTIVITY SHOULD I PREPARE FOR? To fully enjoy our program, you need to be in good cardiovascular shape. The hikes are beautiful but challenging and range 4-6 hours in duration. HOW MANY CALORIES DO I EAT PER DAY? Aligning with The Ashram philosophy on food, we do not count calories. Our locally-sourced food is organic, vegetarian, and delicious, and can be tailored to meet your individual goals. Please call The Ashram at 1.818.222.6900 any time Monday through Friday from 9:00am to 4:00pm PST. You can also email us at mallorca@theashram.com and we will be happy to answer any questions that you may have.